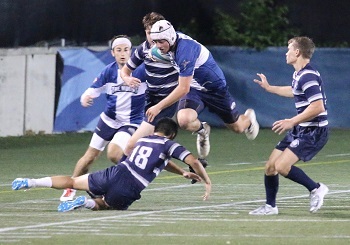 After three weeks of intense preseason scrimmages, the Mount St. Mary's University men's rugby team traveled to Georgetown University for its first regular season matchup of the Fall 2018 season. The Mount ruggers found themselves up against a young and talented Hoya team that controlled play for most of the first half. Georgetown marched downfield with disciplined play only to have the Mount stop each drive inside their own 22 meter mark. 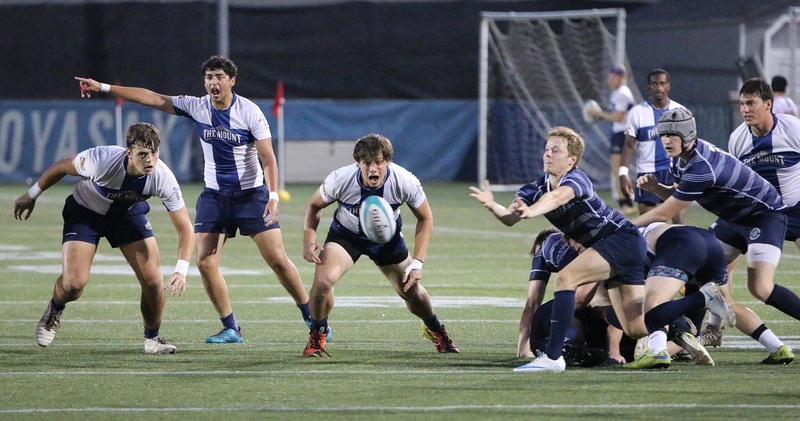 The Mount finally gained control and used the possession to march downfield with both the forwards and backs contributing to score a try at 9:58 by freshman Doug O’Donnell who carried three Hoya defenders with him. Georgetown continued to put pressure on the Mount only to have the Mount and its stingy defense stop them inside their own zone several times. At 37:33 Cuyler McCorkindale took advantage of a defensive breakdown with a 50-meter scamper to put the Mount up 14-0 going into the half. The Mount’s offense came alive in the second half with Colby Rigg powering his way to the try zone at 49:17. Unlike the first half, the Mount played with a balanced attack on both offense and defense that frustrated the Hoyas. Archie Phil Cullen capped off the scoring with tries at the 57:24 and 72:13 mark. Luis Turbyfield was 4 for 5 on conversions, giving the Mount an impressive 33-0 victory. The 2nd game featured the future’s picking up where the first team left off. The young Mounties (mostly freshmen) came out with intensity and controlled the game from the start. The Mount got on the board first with a try by Mike Conlan in the corner at the 6:37 mark. With the missed conversion, the Mount took a 5-0 lead. The game continued with a strong defensive effort by both teams. The Mount brought pressure and broke through with another try at the 26:04 mark by Dominic Nield on a strong run from 15 meters out. With the successful conversion by Mo Cassara, the Mount took a 12-0 lead into the half. The second half was all defense by both teams. The possessions were back and forth with both teams having opportunities only to lose possession deep in the zone. Georgetown finally broke through with a try powered by their forwards at the 67:26 mark. With 5 minutes to play, the Mount regrouped after it appeared the Hoyas regained momentum. The young Mounties played their best defense of the game with the Hoyas in close range with an opportunity to tie it up. The final whistle put an exclamation point on a well-played game by both sides.